“Because it was cozy, simple, and delicious,” she said. I get giddy when people think of me when they discover a new recipe, so you can imagine my delight when my friend Jillian wrote to me about her experience in the kitchen making October Apple Cake. We agreed that the possibilities for variations on this recipe were ripe, and this is how the November Golden Pear Cake came to be. 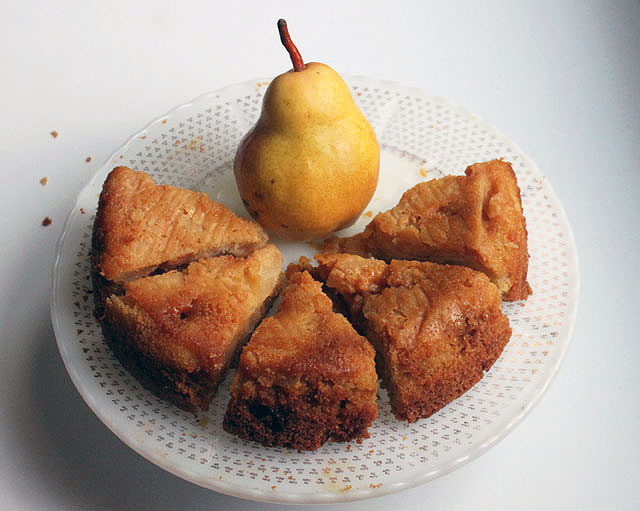 I changed up the modest ingredient list to make my own perfectly sweet & gluten free autumnal cake with pears, substituting oat flour with rice flour and swapping out the chocolate chunks with cubes of buttery caramel. Can I describe a dessert cake as both delicate and hearty? I hope so, because this recipe seems to fit those descriptions, and when sliced in wedges, it radiates like the golden November sunshine. 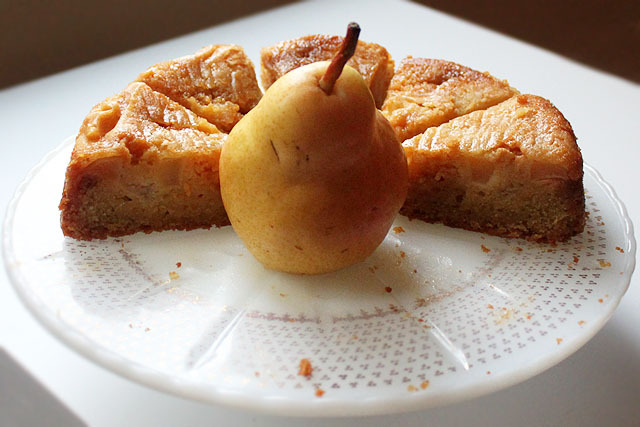 Enjoy, serve, or gift the November Golden Pear Cake at any time of day. It’s amiable to eat with a fork and cup of tea at the breakfast table, as a handheld treat on a fall forest potluck picnic, or as appetizer pick-ed mini bites preceding a festive night’s cheese course. Happy Novembering. 1. Preheat the oven to 350-degrees. Grease a pan with olive oil and dust with flour, set aside (I also lined the bottom with a circle of parchment paper). 2. In a small bowl, mix the flour, salt, and baking powder. 3. In a separate bowl, whisk the eggs for 10 minutes. 4. Peel the pears and chop them into chunks. 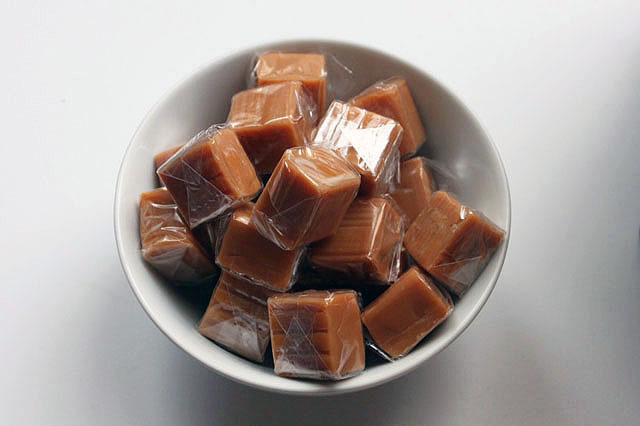 Chop up caramel or chocolate into chunks. 5. Add the brown sugar and olive oil to the fluffy, fluffy eggs and continue to whip for another minute. Slowly incorporate the flour mixture until combined. 6. 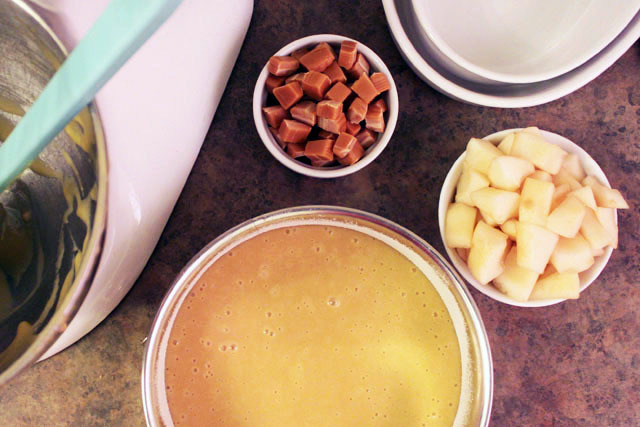 Pour the batter into the prepared pan, then nestle the pear and caramel chunks until they are nice and snug in the batter. 7. Bake for about an hour, then if you can stand the wait, let it cool. Turn out the cake onto a plate and serve hot with drizzled caramel and sprinkled with sea salt, or cold with freshly whipped vanilla cream on top. Everyone deserves a sweet treat every now and then. We think this is the perfect cake to have afternoon tea with. We can’t think of a better way for students to take a break from a hard afternoon of studying than with a slice of cake and a cup of tea. Enjoy! This looks delicious. I need to start baking more, since the weather is starting to get cold here in Chicago. No snow yet though. Think that is a record. Thanks for sharing. Your posts always make me hungry.